This month we are celebrating DAD and our faithful companions. We have tons of fun projects to make for and WITH Daddy as well as a lot of fun opportunities to make projects about or FOR your pets. We have two chARiTy events – both raising funds for WAGS Animal Rescue. Join us on June 23rd from 10AM – 1PM to get a clay paw print made of your best animal friend. Or join us on Thursday, June 28th at 6:00 PM where we are making pet themed board art projects. Part of the proceeds from both events will be donated back to WAGS. We are also hosting a pet food drive. Bring in pet food or supplies and we will enter you into a fun raffle that we are hosting! Don’t forget Dad’s special day too on the 17th. 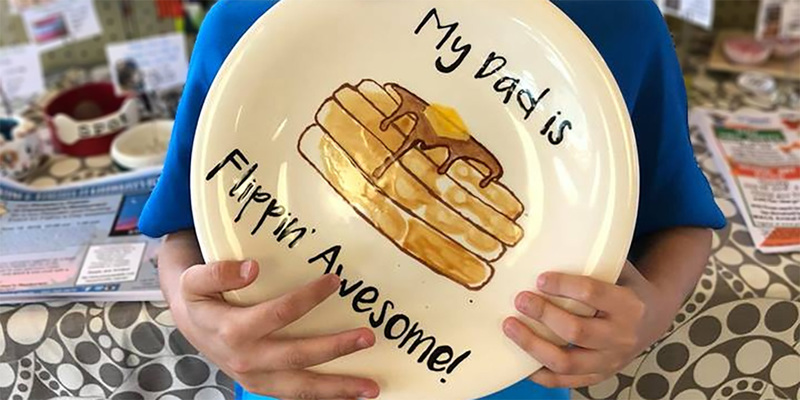 We are hosting a pancake and pottery event on June 10th or a fun opportunity to paint with Daddy on June 17th. We have our camps starting next week as well – but we will always have room for walk ins while camp is in session. We have a busy and fun filled summer ahead of us! We are looking forward to seeing all the wonderful art that is created in the studio this month! Previous postSummer is almost here! Next postSummer Camp is Underway!